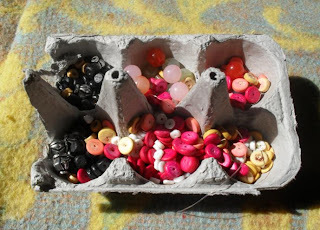 I stored the beads in the half section of an egg carton until an activity presented itself that would lend itself to the use of beads. 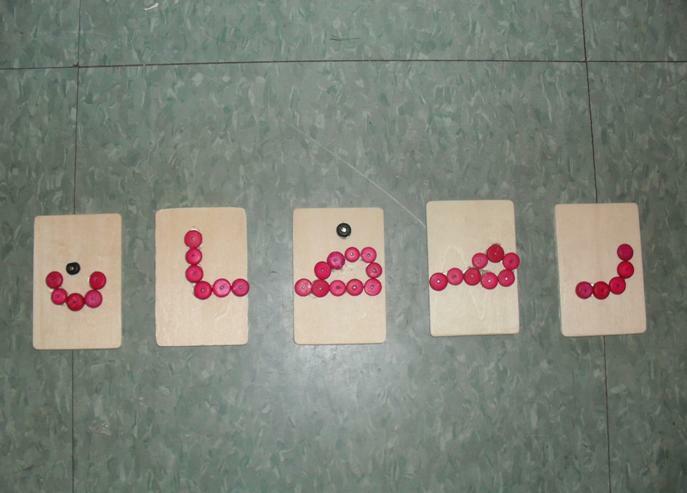 In Montessori education (and increasingly in many non-Montessori classrooms), a tactile approach to learning the alphabet is employed. 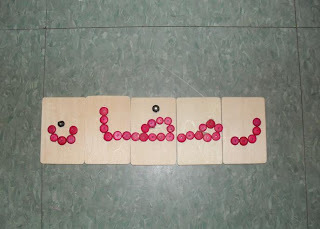 As the Blessed month of Ramadan is upon us, I sought to combine the two to make a tactile Ramadan activity for older toddlers who are being introduced to the alphabet. This is an activity that is nice for toddlers that have passed the 'what is in the hand passes to the mouth' stage and care must be taken due to the chocking hazard that still exists. To eliminate that, as much as possible, I plan to cover this activity with a coating of Mod Podge to seal the beads onto the surface to avoid them coming dislodged insha'Allah. This activity should be closely supervised at all times insha'Allah. The letters are not presented here as they appear in isolation but are presented as they are when connected to one another. 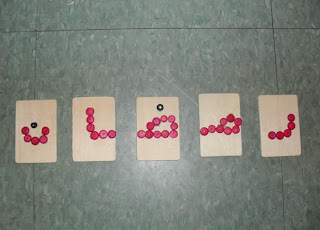 This is an activity whose purpose is to introduce/supplement a lesson on connecting the letters to form words insha'Allah. I know boys aren't usually partial to pink but unfortunately, the pink beads were the most abundant (smile). When the letters are placed together properly, they spell the word Ramadan in Arabic. This is just one way to recycle beads and provide a tactile experience with the Arabic alphabet and it is also a hands-on activity that can be used to invite children to spell words in Arabic. 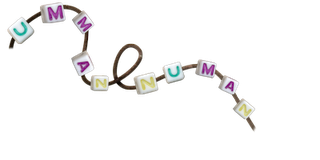 If enough of my bracelets break, I suppose I can eventually do the entire alphabet insha'Allah...lol.